Violin Sonata, K. 372 "Unfinished"
Violin Sonata #5 in F Major, Op. 24 "Spring"
EMI Classics continues to reissue older material in its two-for-the-price-of-one "double fforte series. Many of the performances are first class, and it would be a mistake to pass these releases by because the recordings are not the most recent. Three new double fforte titles are reviewed below. It is pianist Sviatoslav Richter, not violinist Oleg Kagan, who is the center of attention on the Mozart and Beethoven set. This is not necessarily a fault, as both composers saw the violin as an equal partner at best, and even described their earlier sonatas in this genre as works for piano with violin accompaniment. Richter, of course, had reached cult status by the mid-1970s, when these recordings were made. He had not, however, lost his taste for performing chamber works with other musicians. A good partner, he does not grandstand; even though all ears are on him, he gives Kagaan his opportunity to shine as well. Nevertheless, Kagan's playing has less personality than Richter's. This is fine musicianship, but other violinists (such as Willi Boskovsky – see below) have brought more temperament and character to the music. Together, Richter and Kagan are straightforward, warm, and friendly. There's no storming the heavens in these performances, just comfortable, masculine classicism. The Mozart sonatas are not made to wear powdered wigs, and the performers are particularly winning in the charming two-movement K. 379 sonata. Kagaan's tone seems wiry at times, but this could be a fault of the engineering, which discolors Richter's piano in the Mozart recordings. These were recorded live during the "Fête Musicales de Touraine" in 1974. 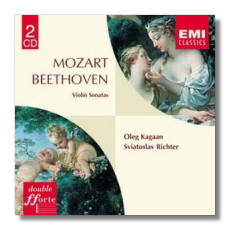 The Beethoven sonatas, recorded two years later in Munich, sound considerably better. This set doesn't discredit either of the musicians, but it is more for fans of Richter than for collectors who want basic recordings of the Mozart and Beethoven works. Janet Baker's set of vocal music by J.S. 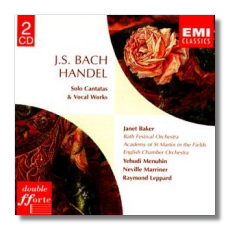 Bach and Handel generously conflates three separate LPs. The Bach cantatas, recorded in 1966, are conducted by Yehudi Menuhin, the remaining Bach arias (1975) by Neville Marriner, and the two Handel cantatas (1967) by Raymond Leppard. There can be no reservations about singing this warm and intelligent. Baker was to her generation as Kathleen Ferrier was to the one preceding hers, and how wonderful it is that Baker still is among the living. As long as her voice remained in prime condition – and these recordings preserve it at its best – she hardly made a false move. Her voice exudes serenity and compassion. Some voices are angelic, and others, like Baker's, are human but still heavenly. Modern musicology has changed our opinions on how this music "should" be performed. Listeners in their 20s and 30s might find these performances too old-fashioned. The instrumental ensembles accompanying Baker are too large by today's standards, the style of playing too Romantic, and the string vibrato too ample. Furthermore, the Handel cantatas are played in "arrangements" by Raymond Leppard. (Leppard filled out the scoring of many early Baroque works to make them seem less austere to our ears, but I'm not at all sure exactly what these "arrangements" are.) Regardless, recordings such as these show why there should be room alongside "original instruments" interpretations for Bach's and Handel's music as our parents came to love it. The original recordings have transferred well to CD. EMI invites buyers to access their website for texts and translations, but my last visit to www.emiclassics.com revealed no such thing. Still, it's a good idea. Conductor Willi Boskovsky was the King of Viennese music – namely, the waltz – for more than 40 years. (He made his reputation as a violinist, however, and he completed several excellent chamber music recordings in that capacity in the 1950s, including a set of Mozart Violin Sonatas with pianist Lili Kraus (EMI Classics 7 63873 2.) In the 1960s and 70s, he recorded several albums of music by the Strauss family for the Decca/London label with the Vienna Philharmonic. (The contents of several of these have been resorted and reissued in a grandly satisfying but very inexpensive 6-CD set: Decca 455 254-2.) With the advent of the digital era, Boskovsky moved back to EMI and completed another series of albums. Highlights from five of these have been pulled together to create this double fforte collection. I don't know what the "Vienna Johann Strauss Orchestra" is (or was), but these interpretations, like their Decca predecessors, are fully symphonic, and the quality of the playing is gorgeous. If this is not the Vienna Philharmonic in actuality, it certainly is an ensemble that plays in the Philharmonic tradition. Boskovsky balances these waltzes between the concert hall and the ballroom. Strauss did, in fact, write some waltzes intended for listeners, not for dancers, but most of the waltzes probably came out of the womb, if you will, to the sound of rustling gowns and feet moving in three-quarter time. Other conductors have imposed more of their personalities on this music. Boskovsky is content to create an atmosphere of elegance – to be smooth, sophisticated, and very refined. Hearing these versions is like enjoying a meal in one of Vienna's oldest five-star restaurants: there are no surprises, but traditionalism rarely has been upheld with such opulent perfection. If there's a caveat, it's that 19 waltzes in a row become monotonous, no matter who is conducting them, or how well they are played. 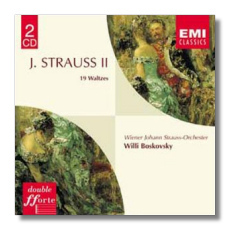 Strauss also wrote polkas, marches, and other genre works, and it would have been good to include some of them – Boskovsky recorded them too – for variety. As a result, these two CDs are for sampling or for reference, unless you are thoroughly waltz mad. The original LPs were recorded between 1980 and 1985, and while there is all the brilliance one could want in this music, there is no digital glare.